This work provides a method for the simultaneous analysis of three organic phosphorus (parathion-methyl, dichlorvos and fenitrothion) and one pyrethroid (fenpropathrin) pesticides by capillary electrophoresis coupled with normal stacking. 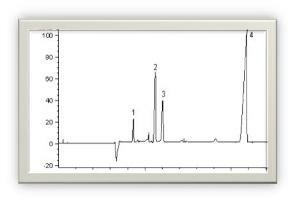 These four compounds were baseline-separated within 25 minutes with the optimized running buffer consisting of a mixture of 50 mM Tris, 60 mM SDS, 15% isopropanol and 25% acetonitrile. The standard mixture solution was mixed with 25 mM SDS (1:4, v/v) before it was injected. Under the optimized conditions, the limits of quantitation (S/N=10) for the four pesticides were 5.21 µg/mL for dichlorvos, 4.82 µg/mL for parathion-methyl and 5.61 µg/mL for fenitrothion and 5.02 µg/mL for fenpropathrin, and the mean recoveries were 80.7% ~ 89.7% with the RSDs of 6.6% ~ 17.1% (n=6). This method could be applied to the detection of pesticides in traditional Chinese medicine if coupled with appropriate offline stacking method.